The IgE-mediated and Th2-dependent late-phase reaction remains a mechanistically enigmatic and daunting element of human allergic inflammation. In this study, we uncover the FcεRI on dendritic cells (DCs) as a key in vivo component of this form of allergy. Because rodent, unlike human, DCs lack FcεRI, this mechanism could be revealed only by using a new transgenic mouse model with human-like FcεRI expression on DCs. In the presence of IgE and allergen, FcεRI+ DCs instructed naive T cells to differentiate into Th2 cells in vitro and boosted allergen-specific Th2 responses and Th2-dependent eosinophilia at the site of allergen exposure in vivo. Thus, FcεRI on DCs drives the cascade of pathogenic reactions linking the initial allergen capture by IgE with subsequent Th2-dominated T cell responses and the development of late-phase allergic tissue inflammation. During an allergic response, the short-lived immediate reaction is followed by a delayed inflammatory tissue response, the late-phase allergic reaction (LAR) (1). LARs, in contrast to early-phase reactions, can persist for up to several days and are characterized by inflammatory tissue infiltrates containing Th2 cells, APCs, and eosinophils (2–4). Eosinophils are the main effector cells of LARs, because they release mediators that induce tissue damage and cause severe organ dysfunction (5–9). In human allergic asthma, LARs can lead to ventilatory insufficiency that, if untreated, can be fatal. Frequent occurrence of pulmonary LARs promotes eosinophil-dominated chronic atopic inflammation, including tissue remodeling and irreversible functional changes in affected organs (9). These attributes make LARs the leading cause of morbidity and mortality in human type 1 allergies (10, 11). Allergen-mediated cross-linking of Ag-specific IgE bound to high-affinity IgE receptors (FcεRI) on mast cells initiates the early-phase reaction in type 1 allergy (12). The LAR, in contrast, follows the sequelae of T cell-mediated delayed-type (type IV) hypersensitivity. Unlike the classical delayed-type hypersensitivity, the induction of LAR is mediated by allergen-specific Th2 and not Th1 cells (13). Mechanistically, in humans the early-phase reaction and the LAR are independent of each other; this is clearly shown by the fact that drugs that efficiently inhibit either mast cell secretion or the effects of mast cell mediators cannot prevent LAR-associated lung inflammation (14). Murine models recapitulate the dichotomous nature of early- and late-phase responses in allergy. For example, mast cell-deficient mice do not develop early-phase reactions, but are capable of developing LAR-associated tissue eosinophilia (15). Despite this mechanistic dissociation of the early- and delayed-type reactions, in humans both of these responses are evidently driven by IgE. This was shown by studies in patients with allergies an asthma, in whom treatment with the humanized anti-IgE mAb omalizumab reduced the mast cell-dependent early-phase reaction and the subsequent LAR in the lungs (16). These data also emphasize that the occurrence of LARs in humans depends on the IgE-mediated activation of effector cells, other than mast cells. Mice constitutively express FcεRI only on mast cells and basophils, but lack its expression on any of the APCs (17). APCs in humans, most notably dendritic cells (DCs), constitutively express FcεRI (18–21). In vitro experiments have shown that IgE bound to FcεRI on human DCs increases Ag uptake, processing, and presentation to memory CD4+ T cells (18). Therefore we hypothesized that FcεRI on DCs may be important for the regulation of delayed-type atopic inflammation in vivo. In this study, we describe a new transgenic (TG) mouse strain with human FcεRIα expression targeted to DCs. This animal model allowed us to study in vivo consequences of human-like constitutive FcεRI expression on DCs for the induction of T cell immunity. The huFcεRIα gene was amplified by PCR and inserted into the plasmid vector pIRES2-EGFP (Clontech). The resulting huFcεRIα-IRES-eGFP cassette was cloned downstream of the murine CD11c promoter in a puC19-based vector. This construct was injected into oocytes for transfer into pseudopregnant mice. Resulting α-DC TG founder mice transmitted their transgene at a Mendelian rate. Male and female BALB/c, C57BL/6, DO11.10, and OT-II mice were obtained from The Jackson Laboratory. IgE−/− mice were obtained from H.C. Oettgen. The TG strain was bred on both BALB/c and C57BL/6 backgrounds. α-DC TG mice were crossed into the IgE−/− BALB/c background. Mice were genotyped by PCR amplification of mouse tail DNA. All mice were housed under specific pathogen-free conditions. Mice studies were approved by the local ethic committee. Mice were immunized with 100 μg OVA (Sigma-Aldrich) or 1 μg Bet v 1 i.p. or epicutaneously weekly for 4 wk. Allergic lung inflammation was induced by challenge with aerosolized OVA (4% w/v) or birch pollen extract (1% w/v) on two successive days. Human IgE mAb anti-NP (4-hydroxy-3-nitrophenylacetyl) was obtained from Serotec, and PE-labeled anti-human FcεRIα was obtained from eBioscience. Anti-mouse mAbs used for immunostaining included biotin-conjugated anti-IgE (Southern Biotech); PE-labeled anti-F4/80 (eBioscience), anti-DO11.10/KJI-26, anti-MHC class II (BD Pharmingen), and anti-CCR3 (R&D Systems); PE-Cy5-labeled anti-MHC class II and anti-CD4 (eBioscience); PerCP-labeled anti-CD45R/B220 (BD Pharmingen); PerCP-Cy5.5-labeled anti-Ly-6G and Ly-6C/Gr-1 (BD Pharmingen); allophycocyanin-labeled anti-CD45 (BD Pharmingen); PE/Cy7-labeled anti-CD11b, anti-CD19 (both Abcam), and anti-CD8a (eBioscience); and allophycocyanin-Alexa Fluor 750-labeled anti-CD11c and anti-CD3e (eBioscience). mAbs used for immunodepletion were biotinylated anti-CD11c, anti-CD19, anti-B220, anti-GR-1, anti-TER-119, anti-CD11b, anti-CD8 (all from BD Pharmingen), and anti-NK-1.1 (eBioscience). Spleens, lymph nodes, intestines, and livers were removed from mice, dissected, and digested in collagenase D (1 mg/ml; Roche Applied Science) for 40 min at 37°C. Single-cell suspensions were prepared with 40-μm pore-size filters (Falcon). Cells were washed with chilled PBS (Life Technologies), and RBCs were lysed (0.15 M NH4Cl, 1 mM KHCO3, 0.1 mM Na2EDTA, pH 7.2–7.4). Single-cell suspensions from lungs were generated the same way, omitting the collagenase digestion step. Single-cell suspensions were incubated on ice for 30 min with fluorochrome-labeled mAbs. Nonspecific mAb binding was blocked with 10% rat and hamster serum. After two washes, fluorescence was analyzed on a FACScan or FACSAria flow cytometer (Becton Dickinson). Lung T cells and eosinophils were identified as CD45+CD3+ cells and CD45+GR-1intermediate, CD3neg, and CCR3+ cells, respectively. For CD4+ T cell isolation, spleens and inguinal and mesenteric lymph nodes were removed, and single-cell suspensions were prepared. Cells were labeled with biotinylated anti-CD11c, anti-CD19, anti-B220, anti-GR-1, anti-TER-119, anti-CD11b, anti-CD8, and anti-NK-1.1 (2 μg/ml each) for 30 min, and then reacted with anti-biotin microbeads (Miltenyi Biotec). mAb-bound cells were depleted using a magnet (Macs, Milteny Biotec). This procedure typically yielded T cells with a purity >95%. For DC isolation, CD11c+CD19neg spleen or CD11c+CD45+ lung cells were sorted using a FACSAria flow cytometer. Cell purity obtained was >99%. T cells (6 × 104 cells) and CD11c+ DCs (3 × 103 cells) were cocultured in 96-well round-bottom plates in RPMI 1640 containing 10% FCS, 2 mM l-glutamine, 100 U/ml penicillin, 100 μg/ml streptomycin, 10 mM HEPES, 1 mM sodium pyruvate, 0.5 mM β-mercaptoethanol (all from Life Technologies), and 1× nonessential amino acids (Biochrom AG). Cells were incubated with OVA (Sigma-Aldrich) or NP-OVA (Biosearch Technologies) and, where indicated, IgE anti-NP. Isolated splenocytes (2 × 105 cells) were stimulated in 96-well round-bottom plates with OVA. For selective FcεRI-mediated and fluid-phase Ag uptake, DCs were purified by positive selection using anti-CD11c magnetic microbeads (Miltenyi Biotec). For FcεRI-mediated Ag uptake CD11c+, DCs were loaded with IgE anti-NP overnight before incubation with 1 mg NP-OVA per 106 cells for 1 h on ice. DCs were washed three times and allowed to internalize and process IgE-bound Ag for 2 h at 37°C. For fluid-phase Ag uptake, CD11c+ DCs were pulsed with NP-OVA for 2 h at 37°C. MACS-purified OVA-specific OT-II T cells (1 × 104 cells) were cocultured with DCs at a 1:1 ratio in 96-well plates (Becton Dickinson). After 72 h of culture, supernatants were harvested for cytokine determination or cells were pulsed with 1 μCi [methyl-3H]thymidine (GE Healthcare) and [3H]uptake was determined after 16–18 h using a Wallac 1205 Betaplate Liquid Scintillation counter. Purified OVA-specific T cells were incubated in 5 μM CFSE solution (Sigma-Aldrich) for 10 min at room temperature. The reaction was stopped by adding 1 v/v FCS (Invitrogen). Cells were washed twice in PBS/10% FCS and twice more in PBS only; 5 × 106 T cells per 200 μl PBS were injected into the prewarmed tail vein. Cytokines were determined using either the CBA Mouse Th1/Th2 Cytokine Kit (BD Biosciences) or ELISAs for detection of IL-4 and IFN-γ using pretitrated Ab sets (eBioscience). Isolated splenic CD11c+ DCs were incubated with IgE anti-NP or medium overnight. Cells were solubilized in lysis buffer (0.5% Brij96, 20 mM Tris, pH 8.2, 20 mM NaCl, 2 mM EDTA, 0.1% NaN3) with protease inhibitors (Complete, Roche) for 30 min on ice. Lysates were reacted with NP-Sepharose beads (Biosearch Technologies) for 4 h at 4°C. Beads were washed with lysis buffer and boiled in nonreducing Laemmli sample buffer. Protein samples were run on 12% SDS-PAGE, transferred to PVDF membranes (Pierce), and probed with first-step reagents followed by HRP-conjugated goat–anti-mouse IgG or goat–anti-rabbit Abs (Pierce). Human FcεRIα was detected with mAb 19-118, murine FcεRIγ was detected with polyclonal rabbit anti-FcεRIγ Abs (Upstate). Detection was performed with SuperSignal Chemiluminescent substrate reagents (Pierce). Total RNA was isolated from single lung cell suspensions using RNeasy Minikit (Qiagen), treated with DNase (Qiagen) and reverse-transcribed to cDNA using random hexamers (RNA PCR Kit, GeneAmp). Primer sequences for target genes and housekeeping gene 5-aminolevulinate synthase 1 (ALAS1): eotaxin 1 fwd 5′-TCC ACA GCG CTT CTA TTC CT-3′; eotaxin 1 rev 5′-CTA TGG CTT TCA GGG TGC AT-3′; RANTES fwd 5′-TCG TGC CCA CGT CAA GGA GTA TTT-3′; RANTES rev 5′-ACT AGA GCA AGC AAT GAC AGG GAA-3′; IL4 fwd 5′-CGA AGA ACA CCA CAG AGA GTG AGC T-3′; IL4 rev 5′-GAC TCA TTC ATG GTG CAG CTT ATC G-3′; ALAS1 fwd 5′-CCA CTG GAA GAG CTG TGT GAC G-3′; ALAS1 rev 5′-TGG CAA TGT ATC CTC CAA CAC AGC C-3′. Target gene expression was determined on a LightCycler 1.2 using LightCycler FastStart kits with SYBR Green (Roche). Data are presented as the relative ratio of target gene expression to housekeeping gene expression. Lungs were removed, fixed in buffered formaldehyde, and embedded in paraffin. The morphologic signs of LAR severity were ascertained by a certified pathologist under the microscope in 5-μm H&E-stained sections. Lung cryosections (7 μm) were fixed in 5% PFA for 4.5 h, flushed with PBS, frozen in OCT medium (Sakura), and mounted on slides with Vectashield Mounting Medium (Vector Laboratories). Sections were examined using an LSM 520 confocal microscope (Zeiss). Statistical significance was calculated using the Student t test. We generated TG mice expressing the IgE-binding human FcεRIα-chain and eGFP under control of the DC-restricted, constitutively active CD11c promoter (α-DC TG mice) (Fig. 1A, Supplemental Fig. 1A). In these mice, discrete populations of eGFP+ cells were detected in spleen and lymph nodes as well as nonlymphoid organs (e.g., lung, intestine, liver) (Fig. 1B). eGFP+ cells were DCs, as shown by their high MHC class II expression, display of costimulatory molecules, and superior T cell stimulatory capacity (Fig. 1B, Supplemental Fig. 2A, 2B). In α-DC TG mice, the majority of splenic DCs expressed FcεRIα at the cell surface (Fig. 1C). In contrast to wild type (WT) mice, DCs from α-DC TG bound human as well as murine IgE (Supplemental Fig. 1B, 1C). Basophils, T cells, B cells, mast cells, and NK cells from α-DC TG mice did not express the TG FcεRIα at the cell surface (Fig. 1D, Supplemental Fig. 1E, 1F; data not shown). TG DCs expressed FcεRI as a chimeric holoreceptor composed of the human FcεRIα-chain and the endogeneous murine FcεRIγ dimer (Fig. 1E). FcεRIβ was not detectable at the RNA or protein level in DCs (data not shown). Thus, murine and human DC-expressed FcεRI has the same subunit composition (18). Comparable to humans, α-DC TG mice expressed higher levels of FcεRI on myeloid DCs than on lymphoid or plasmacytoid DCs (Supplemental Fig. 1C, 1D) (22). DCs from α-DC TG mice, but not WT mice, took up and presented protein Ags in an IgE-dependent fashion (Fig. 1F), indicating human-like function of FcεRI on DCs. Whereas only DCs from α-DC TG animals were able to use the IgE-receptor–mediated Ag presentation pathway, the fluid phase Ag uptake in DCs from α-DC TG and WT mice was identical. Basal IgE serum levels were identical in naive α-DC TG and WT mice (data not shown). Expression of functional FcεRI complexes on DCs of α-DC TG (α-DC TG) mice. A, CD11c promoter (pCD11c)-driven bicistronic construct for DC-targeted expression of huFcεRIα and eGFP. IRES, internal ribosome entry site. B, Multiorgan double immunofluorescence analysis of eGFP (horizontal) and MHC class II expression (vertical) on CD45+ cells in WT (left panels) and α-DC TG mice (right panels). Panels (from top panel): spleen, lymph node, lung, intestine, and liver. C, huFcεRIα and eGFP expression in splenic CD11c+ cells. Upper left panel, Gating of DCs from dot plots showing CD11c expression (horizontal) versus 90° light scattering (SSC, vertical). Upper right panel, Anti-huFcεRIα immunoreactivity of CD11c+ cells from WT (gray histogram) and α-DC TG mice (red histogram). Lower panels, Dot plots showing eGFP (vertical) versus huFcεRIα expression (horizontal) in CD11c+ cells from WT (left) and α-DC TG mice (right). The numerically minor population of eGFP–cells corresponds mainly to dead cells with a very low forward light scatter signal. D, Lack of huFcεRIα expression on basophils. Basophils (red), gated as muFcεRIα+CD4–CD8–B220–c-Kit– cells, and DCs (blue) were analyzed for huFcεRIα (left) and MHC class II expression (right). E, Immunoprecipitation of FcεRI complexes composed of huFcεRIα and muFcεRIγ dimers from DCs. NP-Sepharose precipitates from IgE anti–NP-loaded (right lanes) and unloaded α-DC TG DCs (left lanes) were analyzed by anti-huFcεRIα (upper panel) and anti-muFcεRIγ immunoblotting (lower panel). The coprecipitated 18-kDa moiety in the lower panel corresponds to dimers of muFcεRIγ. F, FcεRI and IgE-mediated Ag uptake in DCs. DCs from α-DC TG (black squares) and WT mice (open circles) were loaded with NP-OVA under conditions permitting FcεRI-mediated (left panel) or fluid phase Ag uptake (right panel). [3H]thymidine uptake of OVA-specific T cells (cpm; vertical) was used to measure uptake and presentation of NP-OVA by graded numbers of DCs (horizontal). The in vivo binding of IgE to DCs was studied in naive mice and mice immunized for OVA-specific IgE production. No IgE was detected on freshly isolated DCs of WT mice regardless of whether the mice were immunized with OVA (Fig. 2A). In contrast, DCs from α-DC TG mice displayed surface-bound IgE, which strongly increased upon elevation of serum IgE by immunization (Fig. 2A). DCs use FcεRI and Ag-specific IgE to augment Ag-specific T cell responses in vivo. A, Detection of DC surface-bound IgE in nonimmunized (upper panels) and i.p. OVA-immunized (lower panels) α-DC TG (right) and WT mice (left). Freshly isolated splenic DCs were reacted with labeled anti-murine IgE mAbs and subjected to flow cytometry. Vertical lines denote the upper cutoff of the reactivity of isotype-matched control mAbs. B, Augmented Ag-specific splenocyte proliferation in α-DC TG mice. Splenocytes from α-DC TG (black bars) or WT mice (open bars) were cultured in the presence or absence of OVA (20 μg/ml), and [3H]thymidine uptake was measured (mean cpm of triplicates). **p < 0.01. C, FcεRI+ DCs loaded in vivo with Ag-specific IgE are superior stimulators of Ag-specific memory T cell responses. Splenic DCs isolated from OVA-immunized α-DC TG (black squares) and WT mice (open circles) were cultured with the same OVA-specific responder T cell population in the presence of graded concentrations of OVA (horizontal). [3H]thymidine uptake was measured (mean cpm of triplicates). D, Augmented in vivo Ag-specific T cell response in α-DC TG mice. T cells isolated either from OVA-immunized α-DC TG (black squares) or from OVA-immunized WT mice (open circles) were cultured with the same population of isolated DCs in the presence of graded concentrations of OVA. [3H]thymidine uptake was measured (mean cpm of triplicates). E, The augmented Ag-specific proliferative response in α-DC TG mice depends on the presence of IgE in vivo. Splenocytes from OVA-immunized α-DC TG (black squares), IgE−/− α-DC TG mice (gray triangles), and WT mice (open circles) were cultured in the presence of graded concentrations of OVA, and [3H]thymidine uptake was measured. Next we investigated the in vivo consequences of this FcεRI-dependent IgE binding to DCs for subsequent T cell activation. As shown in Fig. 2B, Ag-specific T cell recall responses were enhanced in OVA-immunized α-DC TG mice when compared with WT controls. To explore whether IgE binding to DCs is linked to this enhanced response, DCs from immunized α-DC TG and WT mice were isolated and tested for their ability to activate primed T cells in vitro. 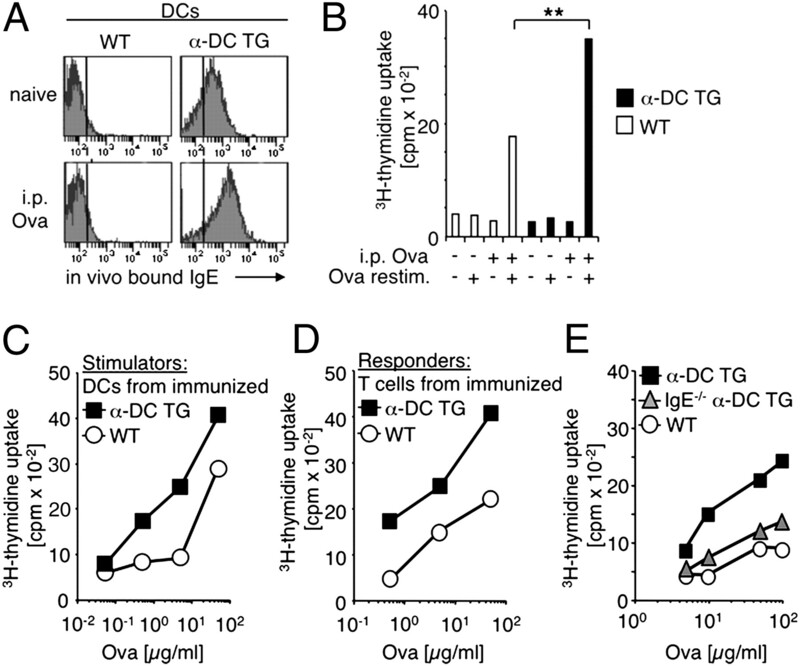 IgE+ DCs from α-DC TG mice elicited stronger OVA-specific recall T cell activation than did IgE– WT DCs (Fig. 2C). IgE+ DCs needed ∼50-fold lower Ag concentration to initiate T cell proliferation (Fig. 2C). This FcεRI-dependent enhancement of T cell activation had also occurred in vivo, because T cells isolated from primed α-DC TG mice proliferated stronger and were more sensitive to a recall stimulation than were T cells primed in WT animals (Fig. 2D). Our experiments link FcεRI expression on DCs with enhanced memory T cell proliferation. To test directly whether in vivo IgE binding to DC-expressed FcεRI is necessary for the enhanced T cell response, we also bred α-DC TG mice on an IgE−/− background. In IgE−/− α-DC TG mice, the T cell proliferation-enhancing effect of FcεRI on DCs was no longer detectable, and OVA-specific T cell proliferation was similar to that seen in WT mice (Fig. 2E). Thus, the binding of IgE to FcεRI on DCs in vivo is essential to induce the augmented Ag-specific memory T cell responses observed in α-DC TG mice. Next we asked whether IgE binding to FcεRI on DC, in addition to enhancing memory T cell responses, could also result in more efficient activation of naive T cells. To test this question, purified DCs were used to activate naive OVA-specific TCR–TG T cells in the presence of haptenized OVA and a hapten-specific IgE. As shown in Fig. 3A, naive CD4+ T cells proliferated much stronger at nonsaturating Ag concentrations when activated by IgE-loaded FcεRI+ DCs than in the absence of FcεRI. Mechanistically, the augmented T cell proliferation resulted from an increased rate of naive T cells pushed into cell cycle and an accelerated propagation through consecutive division rounds of already cycling cells (Supplemental Fig. 3A, 3B). Interestingly, IgE-FcεRI–dependent Ag presentation more efficiently amplified the proliferation of naive than of primed T cells (Supplemental Fig. 3C). FcεRI+ DCs efficiently prime naive T cells for Th2 development and amplify Ag-specific Th2 responses in vivo. A, In the presence of Ag-specific IgE, DCs from α-DC TG mice strongly enhance Ag-specific T cell proliferation at nonsaturating Ag concentrations. DCs isolated from α-DC TG (black squares) and WT mice (open circles) were cultured with naive DO11.10 T cells in the presence of graded concentrations of NP-OVA and NP-specific IgE. [3H]thymidine uptake was measured (mean cpm of triplicates). B, Augmented IL-4 and reduced IFN-γ secretion by OVA-specific T cells primed by DCs after FcεRI-dependent Ag uptake. FcεRI+ DCs loaded with NP-specific IgE or unmodified DCs were pulsed with NP-OVA or medium only and cocultured with naive OVA-specific T cells. Mean concentrations (±SEM) of IL-4 (pg/ml, left vertical axis) and IFN-γ (ng/ml; right vertical axis) in culture supernatants as obtained in three independent experiments are shown. C, Augmented OVA-specific in vivo Th2 responses in α-DC TG mice. Splenocytes from naive or OVA-immunized α-DC TG (black bars) and WT mice (open bars) were harvested and restimulated with OVA. Pooled splenocytes from three mice per group were used. Concentrations of IL-4 (pg/ml, left vertical axis) and IFN-γ (ng/ml; right vertical axis) in supernatants were determined by ELISA. D, IL-4/IFN-γ secretion ratios of splenocytes from OVA-immunized α-DC TG and WT mice. *p < 0.05, **p < 0.01. We also characterized the quality of the T cell responses elicited from naive OVA-specific T cells by DCs after either FcεRI-dependent or fluid phase Ag uptake. After Ag uptake in fluid phase, DCs activated naive OVA-specific T cells to produce IFN-γ, but little IL-4 (Fig. 3B). 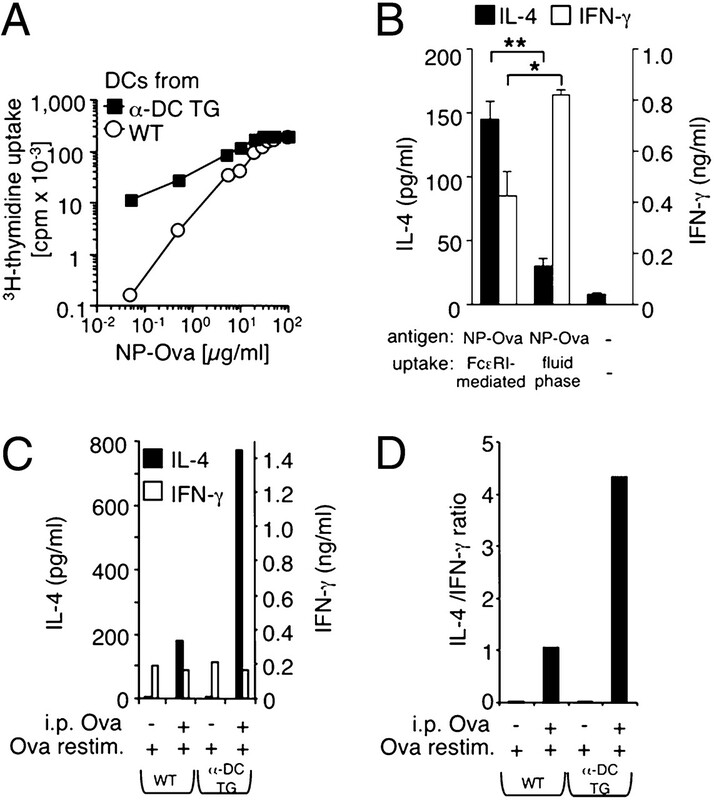 When OVA was targeted to FcεRI by IgE, in contrast, DCs induced Th2 differentiation characterized by enhanced IL-4 and reduced IFN-γ secretion (Fig. 3B). To determine whether IgE-FcεRI–dependent Th2 amplification occurred also in vivo, α-DC TG and WT mice were immunized with OVA i.p. or epicutaneously, and cytokine secretion from spleen cells was analyzed. Immunization via either route resulted in strongly amplified, Ag-dependent IL-4 and IL-5 secretion as well as increased Th2:Th1 cytokine ratios in α-DC TG compared with WT mice (Fig. 3C, 3D, Supplemental Fig. 3D–F). To explore whether FcεRI on DCs modifies tissue inflammation, we analyzed pulmonary infiltrates in OVA aerosol-challenged α-DC TG and WT mice. The challenge-dependent increase in CD45+ cell infiltration was 2.6-fold higher in lungs of α-DC TG mice, compared with WT mice (+78% versus +30%) (Fig. 4A). The CD45+ lung cell populations of α-DC TG mice and of WT mice, however, contained similar proportions of F4/80+ macrophages and T cells (Fig. 4B). Thus, T cells are increased to the same extent as the total CD45+ cell infiltrate in the lungs of α-DC TG mice. When we transferred OVA-specific T cells into subsequently OVA-challenged recipients, they underwent an average of 67% more cell divisions in the lungs of α-DC TG mice compared with WT controls (mean divisions in α-DC TG, 5.5; mean divisions in WT, 3.3) (Fig. 4C). Thus, the increased T cell numbers in the lungs of α-DC TG mice are, at least in part, due to an enhanced rate of allergen-dependent T cell proliferation in situ. Exacerbation of allergic late-phase inflammation in α-DC TG mice. A, Quantification of allergen-induced lung infiltration with CD45+ hematopoietic cells. Naive (PBS) and i.p. OVA-immunized (Ova) α-DC TG (black bars) and WT mice (open bars) were exposed to aerosolized OVA. The number of CD45+ cells in lung cell suspensions was measured by flow cytometry and normalized to the content of CD45+ cells in the lungs of nonimmunized mice. Mean values (±SEM) obtained with three mice per group are shown. B, Subtyping analysis of the hematopoietic inflammatory lung infiltrate in OVA-sensitized and OVA-challenged α-DC TG (black bars) and WT mice (open bars). The mean percent contribution (±SEM) of F4/80+ macrophages, CD11c+ myeloid cells, eosinophils, and T cells to the CD45+ lung infiltrate as determined in three mice per group is shown. C, Measurement of in vivo proliferation of OVA-specific lung T cells. CFSE-labeled DO11.10 T cells were transferred in OVA-immunized WT (left panel) and α-DC TG mice (right panel) and mice were exposed to aerosolized OVA. DO11.10 T cells were identified by their reactivity with the clonotype TCR-specific mAb KJI-26 (vertical). Gate 0 defines nondivided cells. CFSE dilution allows tracking of up to 8 cell divisions in OVA-specific lung T cells (gates 1–8). Mean cell division numbers are indicated. D, Representative examples of inflammatory lung pathology in α-DC TG mice. H&E-stained lung sections show inflammatory infiltrates formed by mononuclear cells and eosinophils both in lung parenchyme (left panel) and the interalveolar septae (right panel). Original magnification ×100. *p < 0.05, **p < 0.01. The most explicit feature of infiltrate composition in α-DC TG mice was the 2-fold increase in the percentage of pulmonary eosinophils compared with WT mice (Fig. 4B). 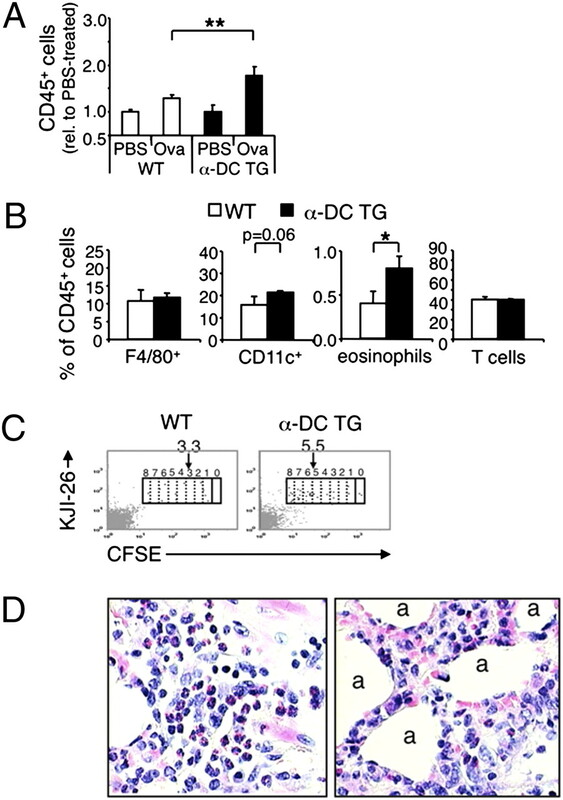 This increase corrected by the increase in total CD45+ cell counts amounts to an overall 5.2-fold eosinophil predominance in the lungs of α-DC TG mice compared with WT mice. Eosinophils were present in perivascular and peribronchial inflammatory cuffs and in the lung parenchyma, including the interalveolar space both in TG (Fig. 4D) and WT animals (not shown). Thus, the expression of FcεRI on DCs enhances lung T cell proliferation and tissue eosinophilia in allergic lung inflammation. CD11c+ lung cells, which include a subpopulation of lung macrophages and DCs, were slightly more abundant in α-DC TG mice than in WT mice (Fig. 4B). This observation led us to analyze the subset composition and function of these cells in more detail. Interestingly, most CD11c+ cells were eGFP– and FcεRI– in noninflamed lungs of α-DC TG mice (Fig. 5A). When purified, those cells poorly presented Ag to T cells (Fig. 5B) and displayed high-level autofluorescence in WT and α-DC TG mice (Fig. 5C). Thus, eGFP–CD11c+ cells qualify as lung macrophages (23). In striking contrast, the eGFP+CD11c+ lung cells expressed FcεRI (Fig. 5A) and strongly presented Ag to T cells (Fig. 5B), but were not autofluorescent (Fig. 5C). Thus, eGFP expression marks the functionally relevant CD11c+ DC population in the lungs of α-DC TG mice. CD11c+ lung DCs were rare in naive or mock-treated α-DC TG mice, but were increased an average of 9-fold after allergen challenge of sensitized mice (Fig. 5D). Histologically, in naive or mock-treated α-DC TG mice, eGFP+ DCs localized close to bronchioli (Fig. 5E). In OVA-sensitized and challenged mice, large numbers of eGFP+ DCs infiltrated bronchioli and small bronchi as well as the alveolar lung parenchyma (Fig. 5E). Higher magnifications revealed that some of the eGFP+ DCs localized just beneath the bronchial epithelium and projected a discontinuous network of dendrites into the basal lamina (Fig. 5E). Enhanced recruitment of FcεRI+ DCs in allergic lung inflammation. A, The number of eGFP+CD11c+ cells is strongly increased in allergic lung inflammation. eGFP expression of CD45+CD11c+ lung cells from i.p. OVA-immunized α-DC TG mice after inhalation of PBS only (left histogram) or of aerosolized OVA (middle histogram). Vertical lines indicate the upper cutoff of autofluorescence of CD45+CD11c+ lung cells from WT mice. Gated eGFP+ (P2, blue), but not eGFPneg (P1; red) CD11c+ lung cells express huFcεRIα (right histogram). B, eGFP+ but not eGFPneg CD11c+ lung cells are strong stimulators of OVA-specific T cell proliferation. eGFP+CD11c+ (full circles) and eGFPnegCD11c+ lung cells (full triangles) and, for comparison, eGFP+CD11c+ splenic DCs (open circles) were cocultured with OVA-specific T cells (T cells alone: open diamonds) in the presence of graded concentrations of OVA (horizontal). Mean cpm of triplicate cultures. C, Lung DCs but not macrophages (Mϕs) express eGFP. Lung sections from OVA-immunized and challenged α-DC TG mice were analyzed by confocal microscopy. Because of their broad autofluorescence, Mϕs show equal light emission both in the green (arrows, upper left panel) and in the red wavelength ranges (arrows, upper right panel). DCs, in contrast, emit light in the green eGFP emission spectrum only (arrowheads). Lower left panel, Merged image of the upper panels. Lower right panel, Green and red autofluorescence in lung Mϕs of WT mice; no cells with green but not red fluorescence in WT mice. D, Quantification of inflammation-associated recruitment of FcεRI+ DCs. The percentage of eGFP+ DCs among CD45+ lung cells was determined in naive or OVA-treated α-DC TG. Results are presented as mean percent (±SEM; vertical) as obtained with three mice per group. E, Bronchial and peribronchial accumulation of eGFP+ DCs in OVA-dependent allergic lung inflammation. Lung sections from nonimmunized mock-challenged α-DC TG mice (PBS/PBS; first panel), from nonimmunized OVA-challenged α-DC TG mice (PBS/Ova), and from OVA-immunized and OVA aerosol-challenged α-DC TG mice (Ova/Ova; third and fourth panels) were analyzed by confocal laser scanning microscopy. Higher magnification shows eGFP+ DCs closely associated with bronchi and projecting dendrites into the bronchial basal lamina (arrowheads in fourth panel). **p < 0.01. b, bronchus/bronchiolus; e, bronchial epithelium; v, blood vessel. The important question remained whether it is indeed the ligand-dependent function of DC-expressed FcεRI that mediates the enhanced lung eosinophilia observed in α-DC TG mice. To explore this question, allergen-dependent eosinophil lung recruitment was also studied in IgE-deficient α-DC TG mice. As shown before, allergen-induced lung eosinophilia was significantly more pronounced in α-DC TG than in WT mice (Fig. 6A). Importantly, this enhancement of lung eosinophilia strictly depended on IgE, because it was entirely lost in IgE-deficient α-DC TG mice (Fig. 6A). Thus, the in vivo interaction of IgE with its high-affinity receptor expressed on DCs is essential for strong eosinophilic lung inflammation in response to allergen exposure. FcεRI on DCs instigates IgE-dependent pulmonary Th2 activation and eosinophil chemoattraction into the lung. A, IgE-dependent eosinophil lung infiltration in α-DC TG mice but not in WT mice. Lung eosinophils in naive or OVA-immunized WT (open bars), α-DC TG (black bars), and IgE−/− α-DC TG mice (gray bars), after either PBS (−) or OVA inhalation, were counted by flow cytometry. Mean eosinophil counts (±SEM) relative to the counts in the group treated with PBS only as obtained with lungs from three mice per group are shown. B, Quantitative real-time PCR analysis of eotaxin, RANTES, and IL-4 mRNA expression in lung cells of naive and OVA-immunized and challenged WT (open bars), α-DC TG (black bars), and IgE−/− α-DC TG mice (gray bars). Expression values obtained were normalized to housekeeping gene expression and mean values (±SEM, vertical) obtained with at least three mice per group are given. **p < 0.01. n.d., not determined. We also screened by quantitative PCR for eosinophilia-regulating lung cytokines that are upregulated by DC-restricted FcεRI expression, but are downregulated by a superimposed lack of IgE. Eotaxin-1, in contrast to several other candidates, was overexpressed in the lungs of α-DC TG mice and reverted to WT expression in the absence of IgE (Fig. 6B). 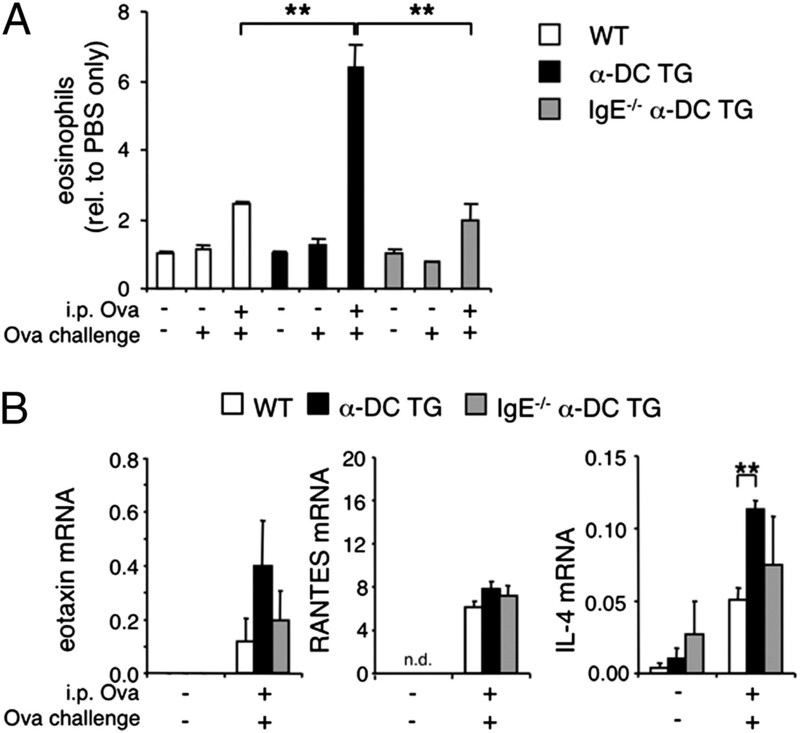 In contrast, RANTES expression did not depend on DC-expressed FcεRI or IgE (Fig. 6B). Eotaxin expression in the lungs is considered dependent on Th2 cytokines released in situ. Among the Th2 cytokines tested, selective lung IL-4 expression strictly followed the FcεRI- and IgE-dependent regulation pattern of Eotaxin-1 (Fig. 6B). Thus, IL-4 and Eotaxin-1 lung expression is linked to FcεRI- and IgE-mediated lung eosinophilia, a condition that is not operative in WT mice but is assigned to mice by FcεRI expression on DCs. In type 1 allergic diseases, allergen-specific Th2 cells are critical both as regulators of allergen-specific IgE production and as effectors of delayed type atopic tissue inflammation (i.e., the LAR) (24). It has remained unclear whether IgE itself can regulate, via its high-affinity receptor on DCs, Th2 responses and Th2-dependent inflammation. Using α-DC TG mice, we show that allergen-specific IgE bound to FcεRI on DCs modifies the critical allergen threshold required for Th cell activation and, thus, strongly augments Th cell responses in vivo. This IgE- and FcεRI-dependent Ag presentation by DCs increases primed Th cell responses both in vitro and in vivo. It also augments the activation of naive Ag-specific Th cells that may ensure that an enhanced repertoire of allergen-reactive Th cells can take part in the allergic response. IgE-FcεRI-dependent Ag presentation by DCs is not neutral in regard to the type of Ag-driven Th cell differentiation elicited. In this study, we demonstrate that FcεRI in the presence of IgE instructs DCs to push recently activated naive Th cells into the Th2 pathway of differentiation, while default Th1 development is comparatively suppressed. We conclude that IgE in the context of FcεRI+ DCs is an integral component of an amplifying, positive feedback loop designed to maximize Th2 responses. The understanding of how DCs are turned into Th2-promoting APCs is of critical research interest in type 1 allergy, although only a few relevant mechanisms have been identified. Thymic stomal lymphopoietin and certain helminth products condition DCs for Th2 priming (25, 26), whereas OX40 ligand acts as a costimulatory, but not as a polarizing signal for Th2 expansion (27). Our new data demonstrate that a member of the family of Ig receptors, FcεRI, can be added to the list of DC-modifying components of Th2 immunity. In contrast to the previously established factors, FcεRI on DCs has its role both in Th2 priming and in the expansion of already primed Th2 cells. Whereas the chain of molecular events leading to FcεRI-dependent Th2 differentiation by DCs still needs to be fully uncovered, our data clearly show that the FcεRI-amplified Th2 response is relevant for inflammation in vivo. This is demonstrated in our studies on Ag-dependent induction of inflammatory responses in murine lungs. FcεRI on DCs increased the systemic and augmented the local allergen-specific Th2 activation in the lungs after airborne allergen exposure. The ensuing increased Th2 cytokine production in situ, including eosinophil chemoattractants, led to enhanced lung eosinophilia. Thus, the IgE-FcεRI axis on DCs is causally connected to the regulation of the magnitude of tissue eosinophilia, the main cause for inflammatory organ dysfunction in human type 1 allergy. Previous studies (28, 29) and our current observations in control animals have shown that IgE has no proinflammatory function in the regular asthma models in WT mice, in which FcεRI is not expressed constitutively on DCs. This finding stands in contrast to human asthma, in which atopic lung inflammation was shown to depend on IgE (16, 30). The data presented in our study resolve this discrepancy by showing that the selective expression of FcεRI on DCs suffices to confer to the murine model the characteristic IgE dependence of human late-phase atopic inflammation. 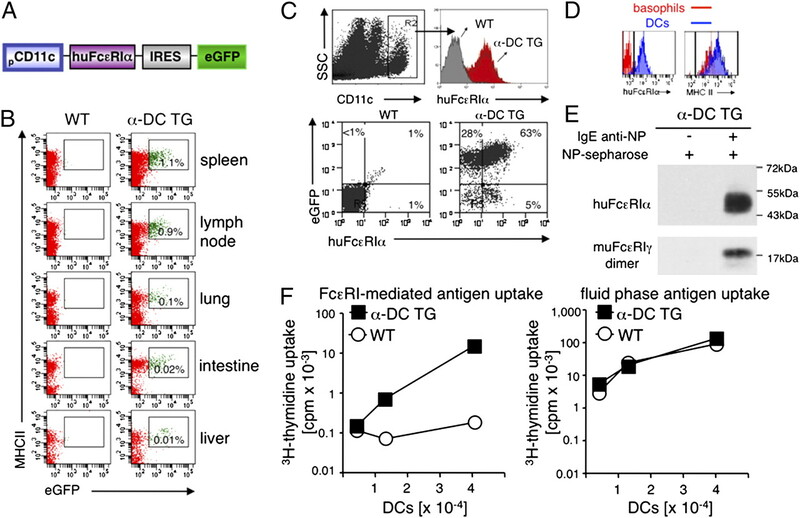 In murine lungs, Th2 activation, Th2 cytokine production, and eosinophil chemoattraction depended in large parts on the in vivo interaction of IgE with FcεRI on DCs. Thus, α-DC TG mice allowed us to identify an important mechanism of human type 1 allergy and thus provide a model to study in rodents allergic pathophysiology as relevant for human allergy. Recent reports have demonstrated the critical role of Ag presentation by basophils for the induction of Th2 responses (31–33). DCs, which were FcεRIneg in these models, induced Th1 responses only. Our experiments recapitulate the selective Th1-promoting activity of WT DCs, but also show that the interaction of IgE with FcεRI on DCs switches their function from being Th1-inducing to being Th2-inducing APCs. In the absence of IgE, FcεRI expression does not induce the Th2 polarizing properties of the DCs. Thus, basophil but not FcεRI-dependent DC functionality can be relevant for the initial Th2 priming much later on, manifesting in clinical allergy. However, for clinical allergy to develop, primary Th2 responses have to expand. In this expansion phase, as shown by our data, FcεRI-dependent Ag presentation by DCs has its critical role by augmenting the Th2 pools from primed and perhaps naive reservoirs. A dominant role of basophils in this phase is unlikely based on their low abundance compared with FcεRI+ DCs in lymphoid and nonlymphoid organs. Thus, FcεRI+ DCs and basophils likely provide two independent pathways of Th2 immunity. To our knowledge, α-DC TG mice also allowed for the first time the direct visualization of the relevant population of Th cell-activating DCs in the lung. This is experimentally important because the DC marker CD11c in the lung, in contrast to other organs, does not discriminate lung macrophages from DCs (23). Our data in α-DC TG mice show that in striking contrast to macrophages, immunostimulatory lung DCs selectively expressed eGFP and FcεRI. These DCs resided within the epithelia of small airways or were juxtaposed to them and projected meshwork-forming dendrites into the bronchial basal lamina. Thus, IgE-armed FcεRI+ airway-associated DCs are in the position to be first to specifically interact with inhaled allergens. After Ag aerosol challenge, FcεRI+ DCs greatly increased in numbers and accumulated around small airways and in the lung parenchyma, which is also typically observed in human asthma (4, 34). This numeric increase of FcεRI+ DCs within the arising allergic inflammation is an important component of the allergic response, because it further increases the contribution of IgE-FcεRI–dependent T cell activation in the allergen-exposed tissue. Recently, it has been demonstrated that a population of murine inflammatory lung DCs elicits Th2 immunity and is induced to express FcεRI (35, 36). Provided the functionality of this induced rather than constitutive receptor expression, our data allow the conclusion that FcεRI expression and not another yet unknown function of inflammatory DCs suffices for the promotion of Th2 responses. For the future, conclusive experiments on IgE-mediated regulation of this new subset of inflammatory DCs will have to await mice that allow conditional and selective ablation of FcεRI on DCs. In conclusion, FcεRI on DCs is not decisive for the initial, limited allergen-specific Th2 response. However, once allergen-specific IgE is induced, DCs start to use FcεRI as an allergen-focusing structure to specifically promote disease-eliciting Th2 responses. Thus, efficacious and persistent blockade of FcεRI on DCs appears to be an interesting therapy for human type 1 allergy that finds support by the recent observation of Th2 rather than Th1 cytokine suppression by anti-IgE treatment of allergic humans (37). In an acute situation, this intervention should reduce the severity of allergic tissue inflammation whereas, if applied chronically, this therapy may correct substantially the Th2 bias of the underlying immune response. Our new model in α-DC TG mice, which more faithfully reflects the human situation of type 1 allergy, will allow future experimental explorations of novel therapies targeting the trimeric human FcεRI on DCs. We thank Dr. Wolfgang Bauer for help with confocal microscopy, Dr. Georg Stingl for critical reading of the manuscript, Dr. Ernst Kriehuber for helpful technical suggestions, and Dr. Thomas Brocker for providing the murine CD11c promoter. This work was supported by Austrian Science Foundation (Fonds zur Förderung der Wissenschaftlichen Forschung) Grants SFB F1813 and SFB F2308 (to D.M.) and SFB F1814 (to U.W. ), National Institutes of Health Grants DK081256-01 (to B.P.) and R01AI075037 (to E.F.), and an Austrian Programme for Advanced Research amd Technology fellowship from the Austrian Academy of Sciences (to E.D.).
. 2008. The development of allergic inflammation. Nature 454: 445–454.
. 1992. T cells and eosinophils in the pathogenesis of asthma. Immunol. Today 13: 501–507. 2001. Allergy and allergic diseases. First of two parts. N. Engl. J. Med. 344: 30–37.
. 2001. Rapid dendritic cell recruitment to the bronchial mucosa of patients with atopic asthma in response to local allergen challenge. Thorax 56: 823–826.
. 2003. Ablation of eosinophils leads to a reduction of allergen-induced pulmonary pathology. Am. J. Physiol. Lung Cell. Mol. Physiol. 284: L169–L178. 2000. Mechanisms of eosinophil-associated inflammation. J. Allergy Clin. Immunol. 105: 651–663.
. 1990. Eosinophilic inflammation in asthma. N. Engl. J. Med. 323: 1033–1039. 2004. The epidemic of asthma and allergy. J. R. Soc. Med. 97: 103–110. 2009. Irreversible airway obstruction in asthma. Curr. Allergy Asthma Rep. 9: 168–173.
. 1996. Fatal asthma. Annu. Rev. Med. 47: 161–168. 1996. Late-phase inflammation: influence on morbidity. J. Allergy Clin. Immunol. 98: S291–S297.
. 2002. Regulation of mast-cell and basophil function and survival by IgE. Nat. Rev. Immunol. 2: 773–786.
. 1993. Activation of CD4+ T cells, increased TH2-type cytokine mRNA expression, and eosinophil recruitment in bronchoalveolar lavage after allergen inhalation challenge in patients with atopic asthma. J. Allergy Clin. Immunol. 92: 313–324.
. 1993. The effect of H1-receptor blockade on the development of early- and late-phase bronchoconstriction and increased bronchial responsiveness in allergen-induced asthma. J. Allergy Clin. Immunol. 91: 1169–1178.
. 1997. Development of eosinophilic airway inflammation and airway hyperresponsiveness in mast cell-deficient mice. J. Exp. Med. 186: 449–454.
. 1997. The effect of an anti-IgE monoclonal antibody on the early- and late-phase responses to allergen inhalation in asthmatic subjects. Am. J. Respir. Crit. Care Med. 155: 1828–1834.
. 2008. IgE in allergy and asthma today. Nat. Rev. Immunol. 8: 205–217.
. 1996. Peripheral blood dendritic cells express Fc epsilon RI as a complex composed of Fc epsilon RI alpha- and Fc epsilon RI gamma-chains and can use this receptor for IgE-mediated allergen presentation. J. Immunol. 157: 607–616.
. 1992. Human epidermal Langerhans cells express the high affinity receptor for immunoglobulin E (Fc epsilon RI). J. Exp. Med. 175: 1285–1290.
. 1994. Expression of functional high affinity immunoglobulin E receptors (Fc epsilon RI) on monocytes of atopic individuals. J. Exp. Med. 179: 745–750.
. 1996. Dendritic cells in normal and asthmatic airways: expression of the alpha subunit of the high affinity immunoglobulin E receptor (Fc epsilon RI -alpha). Clin. Exp. Allergy 26: 648–655.
. 2003. Omalizumab treatment downregulates dendritic cell FcepsilonRI expression. J. Allergy Clin. Immunol. 112: 1147–1154.
. 2004. Accurate and simple discrimination of mouse pulmonary dendritic cell and macrophage populations by flow cytometry: methodology and new insights. Cytometry A 61: 170–177.
. 1993. Allergen exposure induces the activation of allergen-specific Th2 cells in the airway mucosa of patients with allergic respiratory disorders. Eur. J. Immunol. 23: 1445–1449.
. 2007. TSLP: an epithelial cell cytokine that regulates T cell differentiation by conditioning dendritic cell maturation. Annu. Rev. Immunol. 25: 193–219.
. 2009. Helminth products bypass the need for TSLP in Th2 immune responses by directly modulating dendritic cell function. Proc. Natl. Acad. Sci. USA 106: 13968–13973.
. 2007. Dendritic cell expression of OX40 ligand acts as a costimulatory, not polarizing, signal for optimal Th2 priming and memory induction in vivo. J. Immunol. 179: 3515–3523.
. 1997. Allergen-induced bronchial hyperreactivity and eosinophilic inflammation occur in the absence of IgE in a mouse model of asthma. Proc. Natl. Acad. Sci. USA 94: 1344–1349.
. 1994. Active anaphylaxis in IgE-deficient mice. Nature 370: 367–370.
. 1973. Late cutaneous allergic responses in isolated IgE-dependent reactions. J. Allergy Clin. Immunol. 52: 38–46.
. 2009. Basophils contribute to T(H)2-IgE responses in vivo via IL-4 production and presentation of peptide-MHC class II complexes to CD4+ T cells. Nat. Immunol. 10: 706–712.
. 2009. MHC class II-dependent basophil-CD4+ T cell interactions promote T(H)2 cytokine-dependent immunity. Nat. Immunol. 10: 697–705.
. 2009. Basophils function as antigen-presenting cells for an allergen-induced T helper type 2 response. Nat. Immunol. 10: 713–720.
. 1995. Langerhans cell phenotyping: a new tool for differential diagnosis of inflammatory skin diseases. Lancet 346: 1626–1627.
. 2010. Inflammatory dendritic cells—not basophils—are necessary and sufficient for induction of Th2 immunity to inhaled house dust mite allergen. J. Exp. Med. 207: 2097–2111.
. 2007. Induction of high-affinity IgE receptor on lung dendritic cells during viral infection leads to mucous cell metaplasia. J. Exp. Med. 204: 2759–2769.
. 2010. Decreases in human dendritic cell-dependent T(H)2-like responses after acute in vivo IgE neutralization. J. Allergy Clin. Immunol. 125: 896–901, e6.